Imagine that you are a huge soccer fan and that you are an even bigger fan of, for example, Ronaldo. Further, imagine that he would hardly ever play a soccer game near you, so you cannot watch him play. That is how I feel about the composer Joe Hisaishi since he rarely leaves his home country of Japan. When he did visit the Polish city Krakow in 2011, I had the privilege to attend that concert. 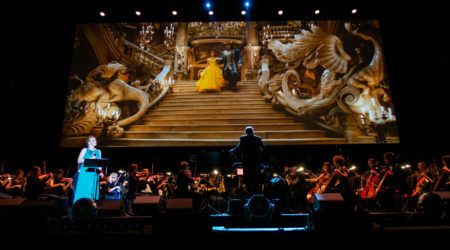 I was ecstatic when I heard he would perform again in Europe during the film music festival in Prague. I bought tickets to this concert immediately, hoping for yet another evening filled with goosebumps and happy tears. I know quite a lot of Hisaishi’s music, but a glance at the program showed me some pieces I had not heard before. The first piece on the program was an example of that. I had never heard of Water Traveller, which is apparently from a live-action comedy called Samurai Kids that he scored in 1993. When Hisaishi walked onto the stage to a huge applause and started conducting this first piece, I knew I was in the right place: the goosebumps and tears were already there! Especially a line in the tuba triggered some very happy emotions inside of me. What a treasure that I still get the same feelings discovering new music by Hisaishi as I did when I heard Princess Mononoke for the first time. The second piece was music from Laputa: Castle in the Sky. It was a suite from this animated movie, created by Studio Ghibli, with a solo for trumpet. The interplay between trumpet and the orchestra was very well executed. I love it when music is not taken directly from the movie but is transformed into a very well written musical piece that can be listened on its own. The last piece before the intermission was again from an unfamiliar movie to me from Studio Ghibli: The Tale of Princess Kaguya. It was a very Hisaishi-like piece with some tense parts in the middle and a happy little tune near the end that brought a smile to my face and most people around me. While most of the concert’s first half was new music for me, the second half was a different story. Since I knew all the pieces, I was ready for a great time. The stage had changed when we returned to the concert hall. The piano had moved to the middle of the stage, and we soon learned why. The first piece was music from three Takeshi Kitano movies: Kikujiro, Hana-bi and Kids Return. 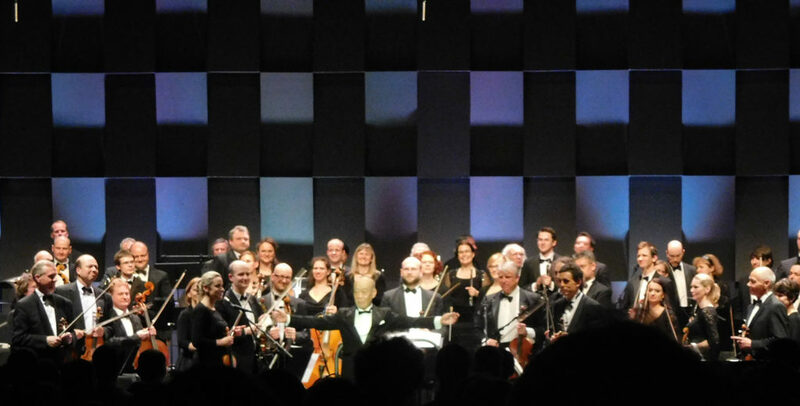 Hisaishi sat at his piano in the middle of the stage with only the string musicians surrounding him. He was able to play his piano and to keep the strings perfectly in check at the same time. All the musicians were synchronized beautifully with the piano, creating a very enjoyable rendition of these three pieces. The best was saved for last: Princess Mononoke. The music from this animated movie is my all-time favorite. As expected, tears and goosebumps were all over the place and soprano Christina Johnston did a wonderful job singing the Mononoke song. When the official program was over, the audience did not stop applauding until Hisaishi returned for the encore. Luckily for me, it was another favorite of mine: “Bird person” from Nausicaa. Before I write my conclusion of this concert, I have to mention an incident that happened after the show. As expected, a lot of people from the audience went to the stage to try to meet Mr. Hisaishi. 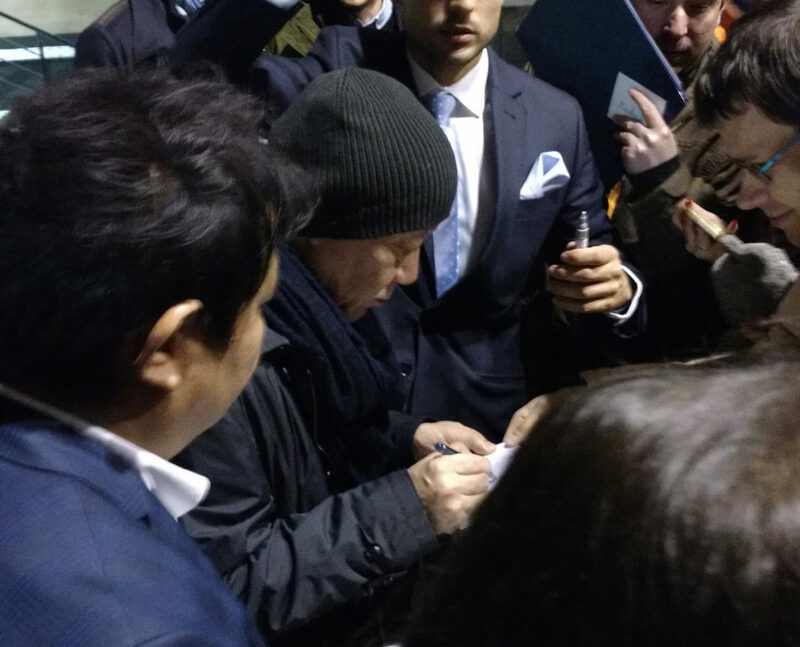 As I predicted, the organizer came out to tell the audience the bad news: Mr. Hisaishi was tired after the show and that he would not come out again to sign anything. After leaving the building, I and my friends were still lingering outside until we noticed a small group of people clustered in a side-street just off the venue’s main entrance. Joe Hisaishi was in the middle of the group, giving autographs! 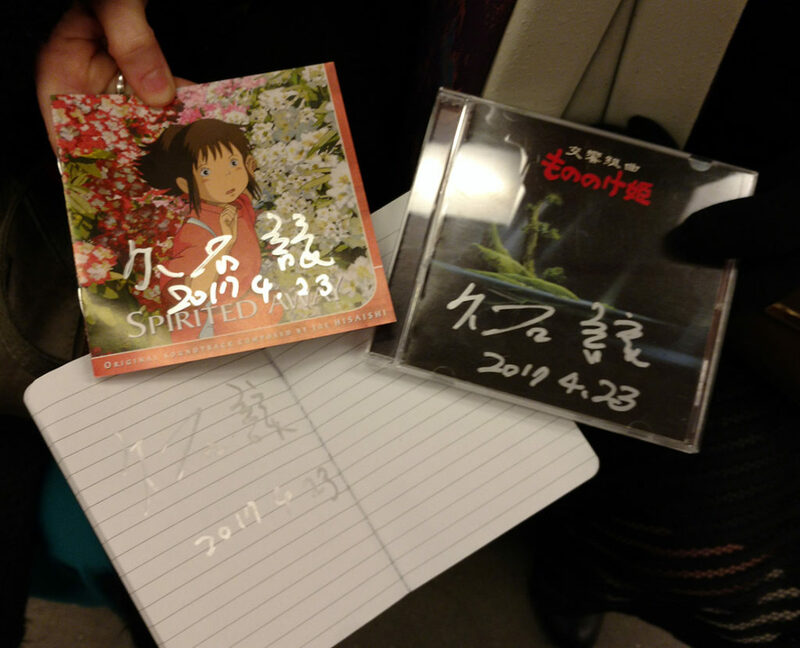 While the organizer announced he would only sign a couple, Hisaishi kept signing and nodding friendly to the fans. It was awesome to see that the group kept very polite and tried to not scare him away. When he was finally done and got in his car, he opened the window to say goodbye to us all. This magical signing session was the icing on the cake of this fantastic evening. The previous Hisaishi concert I attended featured a choir, but I did not miss it at all during this concert. A full orchestra was enough to perform his gorgeous music. I also loved that there were no visual cues. This music is just perfect to listen to on its own. There were a couple of very small misplays in Hisaishi’s piano play. I was told that he had bruised one or more fingers which did not allow him to use his hands as he’s used to. But I do not care about that because overall his piano play was just perfect if you ignore those tiny misplays. 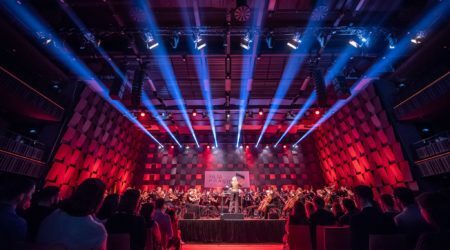 He was not the only one that performed well: my compliments also to The City of Prague Philharmonic Orchestra and Christina Johnston for their awesome performance. This concert will remain one of my concert highlights for a long time to come. I would have said that even without the signing session afterward, but with the framed autograph in my living-room as a constant reminder, it’s longevity in my personal charts is guaranteed. 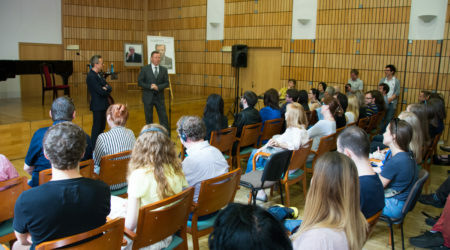 Last but not least, I would like to thank the organizers of Film Music Prague for making this amazing event happen. Thanks a lot for featuring my video! What an amazing concert it was..
You are most welcome. His reaction to your Totoro was great!